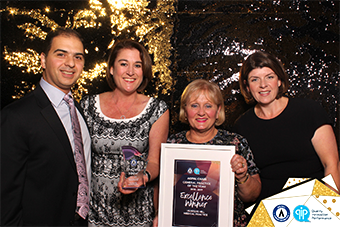 Hunters Hill Medical Practice (HHMP) which lies in the southern part of the Northern Sydney Primary Health Network region, have been awarded the AGPAL Chair General Practice of the Year Excellence Winner. This prestigious national award, given once every 3 years, was presented at the Melbourne AGPAL & QIP 2018 Conference Gala Dinner on Friday 18th May. HHMP has a multi-disciplinary team that works collegially to maintain the highest standards in care and service provision. This is achieved through a combination of regular teaching, multi-disciplinary collaboration and involvement in ongoing medical research. A focus on quality improvement, exceeding accreditation standards and using the latest technology are part of the HHMP approach. HHMP participate in PHN quality improvement initiatives and the Graduate Nurse Transition Placement Program. Teaching and Mentoring both at the practice for GP registrars, third year medical students, student nurses and some overseas trainees, and in Vietnam twice annually. Secret Scenario Training where an incident took place with only the knowledge of three key staff members and the deterioration and management ensuing was consequently analysed with the aid of a video recording. Staff roles, team work and protocols for checking information were discussed, mistakes noted and alternative approaches discussed. A formal education session followed with further discussion. Technology In addition to online bookings and SMS reminders and recalls, HHMP utilises a self-check-in kiosk system on arrival. This quality improvement ensures improved patient identification and contact detail updates leading to increased accuracy of patient records and an increased capacity for staff to have quality interactions with patients. Engagement with Community The practice has a very longstanding history with the Hunters Hill area. HHMP provide medical care for almost 600 boarders at a local private school, offering onsite and practice consultation, support at sports events in the afternoon and work closely with the school counsellors to provide mental health care when needed. Additionally, HHMP medical students attend local public schools each term to engage with year 11 students on mental health, cyber-bullying and recreational drugs etc. HHMP also supports the Hunters Hill Theatrical Society, Heritage Association, Musical Society, Bowls Club and Hunters Hill Art Show, providing hanging space for 50 paintings as well as sponsoring the “People’s Choice Award”. The doctors and allied health team members play a major role in the promotion of health care and regularly give talks on men’s health, healthy ageing, travel medicine and falls prevention.